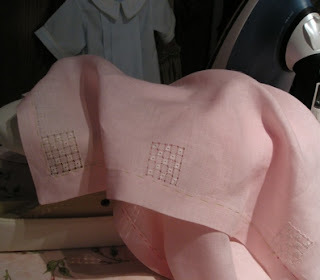 My pulled thread squares are done on one of my day gowns from Wendy Schoen's. The hems are basted and ready to hem stitch and I am ready to embroider! Would rather embroider than hem stitch for now. I see little bullion loop flowers and teeny leaves in my future. 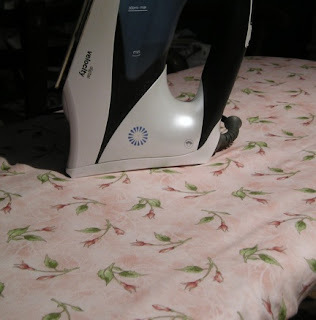 Also got a new pretty for my sewing room, a new ironing board cover from a Cheryl Matis. Love it! It almost makes you want to iron. Well almost I said. I love being able to not only support my other sewing sisters but being able to enjoy their handiwork as well. I would never have taken the time to make an ironing board cover I don't think. But I love a new cover. Its like new towels in the bathroom, new notebooks at the beginning of the school year or the new smell in a new car. Just renewing our surroundings. It is wonderful. Hopefully the pink day gown will be done this week. I also need to work on my artisan submission. I am hoping I can get it done by July 1. Now sure. I am leaving on the 21 for an 8 day retreat so we will see. Love the ironing board cover and the pink linen is beautiful! Thanks Pam, Cheryl has the bows on the ironing board cover. And I LOVE linen. It is so forgiving. I love my ironing board cover! My cat likes the corner of it... I might have to get new ones every year. Such a hardship! hardship, that is the ticket. other things should be so hard.